Home > Blog > Urban Missions - Shall We Put All that Data Out? 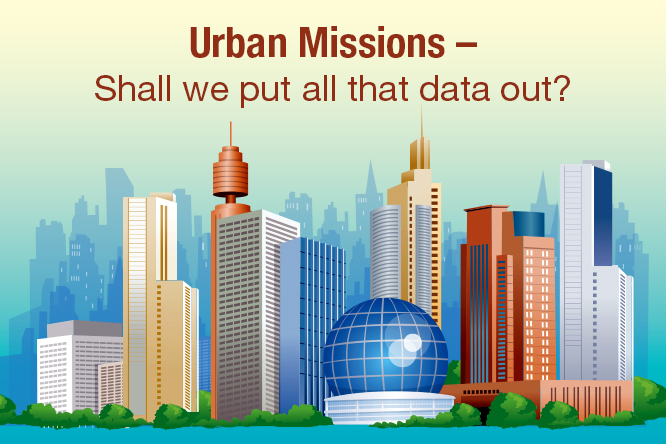 Urban Missions - Shall We Put All that Data Out? Among the several ambitious initiatives the Modi government has embarked on, the ‘Digital India’ and Smart City & AMRUT urban missions clearly have the potential to not only change the grammar of governance but also spark a wave of citizen participation that would pave the way for meaningful public oversight. To make that happen and escape from the plight of top down, politically owned initiatives which are often viewed with cynicism, it is imperative that the program designers work together across ministries and introduce methods and technologies which are smart and proven. If one looks at the Digital India promise, two out of three vision areas talk about ‘governance and services on demand’ and ‘digital empowerment of citizens’. The Smart City mission looks at enhancing the quality of urban life through a slew of infrastructure investments and services while the AMRUT mission is centered around ensuring basic infrastructure services in relatively smaller urban areas. Both these urban missions will necessitate large scale public investments along with substantial urban reforms, particularly through e-governance initiatives. It could make a lot of sense if both the Department of Electronics & Information Technology (that drives the Digital India programme) and the Ministry of Urban Development put their heads together to come up with a few common initiatives that can score quick victories and show tangible proof how the landscape could literally change. For instance, by adopting the appropriate digital information standards such as XBRL, it is a fairly simple step to accurately describe and monitor every single public investment associated with the Smart City and AMRUT programmes all the way down to the projects, tasks and the money spent. Indeed, the whole eco system could be mapped including the contractors and executing departments for better insight and analysis. This wealth of information, of course, could be linked to digital maps and then delivered to the citizen through mobile apps and the language of her choice. Now look at the power in the citizen’s hands if she knows how money is spent in not only her locality in hundreds of comparable situations across the country. In a jiffy, one can exercise oversight in terms of progress, quality parameters and of course, the money spent. Combine this with social media, and you could see the emergence of a vibrant community involved in oversight on investments that matter to their day to day life. Such a community in the future could be base of larger things as well including demand forecast for public services and innovative local tax initiatives. This could be the start of a true c-governance (citizen governance) framework. One could even further stick one’s neck out and even say that it could be easier and cheaper for urban bodies to raise money from the market if an eco system like this already exists before a resource raising exercise. It is worth noting that one reason for the success of the ‘Jalyukta Shivar Abhiyan’ in Maharashtra has been the use of technology in ensuring public participation. The power of open data, mobility and analytics is already seeping into the world of public spending and citizen oversight, especially in developed countries. The Data Act in the US which came into law in 2014 is a case in point. With the launch of these missions, India has an excellent opening to do something path breaking in the areas of transparency, accountability and citizen oversight, given billions of Rupees of our money are to be spent. We should board this bus!